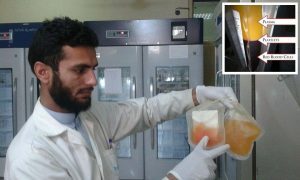 The white blood plasma procedure started for the first time in eastern Nangarhar province of Afghanistan, the local officials said Sunday. The provincial public health directorate chief, Dr. Najibullah Kamwal, said the procedure has been launched in the provincial hospital with the support of the Healthnet TPO organization and the Ministry of Public Health of Afghanistan. Dr. Kamwal further added that the Afghan patients can now visit the Nangarhar provincial hospital for the procedure. He said the launch of the procedure in Nangarhar will help the patients to have the procedure done inside the country and there will be no need for them to visit the neighboring countries for the procedure or travel to other countries. According to Dr. Kamwal, the procedure will be done everyday from 7am in the morning till 2 pm in the afternoon in the provincial hospital. This comes as the Afghan patients were mostly visiting Pakistan and other regional countries to seek treatment with the officials saying that millions of Dollars were flowing out of the country due to the absence of proper health services inside the country. The Afghan government had earlier instructed the Ministry of Public Health to take necessary measure for paving the way for the provision of treatment and health services inside the country.